We already know that having a diet that is rich in fruit and vegetables has been linked with lower stroke risk in several previous studies. However those studies didn’t explain why to the satisfaction of researchers at Norwich Medical School at the University of East Anglia. 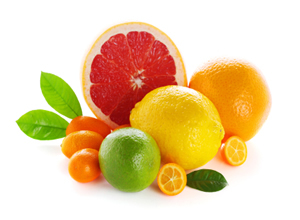 For their recent study, they focused on compounds called flavanones that are present in citrus fruit and found that could be the vital element that helps reduce stroke risk. This is a fairly large scale undertaking, unlike many pieces of research which feature numbers only in double figures, these researchers evaluated 14 years of follow-up data from the U.S. Nurses’ Health Study . Their new research involved nearly 70,000 women who reported their food intake every four years and included details on how much fruit and vegetable they ate. – Total flavonoid intake did not reduce stroke risk, but intake of flavanones did, the researchers said. – Women who ate the most flavanones had a 19 percent lower risk of blood-clot related stroke than those who ate the least. – The main benefit came from oranges and grapefruit. Study leader Aedin Cassidy, who is Head of Nutrition at Norwich, commented that women wanting to reduce the risk of ischemic [blood clot-related] stroke, need to eat more whole fruit, but not juice because the fruit contains more flavanones and no added sugar. On just why flavones are so helpful, the researchers speculate that it’s possible that the flavanones in citrus fruit improve blood vessel function or reduce inflammation, both of which have been linked with stroke risk. As women actually have a higher incidence of strokes than men do, particularly if they have an early or enforced menopause due to hysterectomy, it is important to take preventive action, particularly if you have any family history of heart disease. Having good levels of progesterone will reduce that risk due to its preventive action, and you can improve your chances further by eating more oranges and grapefruit. Also the research clearly indicated that women who ate the most flavonoids also had a healthier lifestyle than those who had the greatest risks. They smoked less, exercised more and consumed less caffeine and alcohol than the highest risk group. But, if you are really not a fruit or veg person then take heart because as well as being present in fruit and vegetables, flavonoids (the group name of which flavones are one subclass) are also found in red wine and dark chocolate, but I don’t advise large quantities of either! Have you ever thought about piuhislbng an e-book or guest authoring on other sites? I have a blog centered on the same subjects you discuss and would really like to have you share some stories/information. I know my visitors would appreciate your work. If you’re even remotely interested, feel free to shoot me an e-mail.